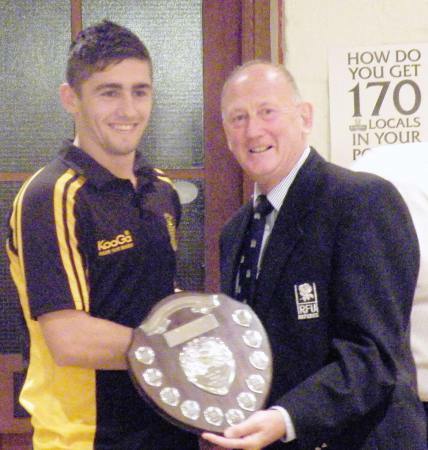 Paterson received the “Bill Osborne Memorial Shield” from BBC Radio Cornwall’s sports reporter Peter Richmond at the club’s Annual General Meeting held at the St. Austell Brewery’s Visitor Centre last Wednesday evening. Despite the Cornish All Blacks’ indifferent start to the League campaign Paterson has been showing good try-scoring form for his side and is certainly a crowd favourite at Polson and hopes to be involved with Cornwall during the 2013 campaign. Paterson was delighted with his award. He said. “I am really delighted to have received this award and to see my name alongside some of the finest players to have worn the black and gold shirt in recent seasons. To be ranked alongside previous winners such as Ben Hilton and Ryan Westren is a massive honour. “Hopefully we will be able to build on last season’s results when we commence the 2013 Bill Beaumont Cup campaign. Having come so close last season the squad are determined to go all the way to Twickenham”. 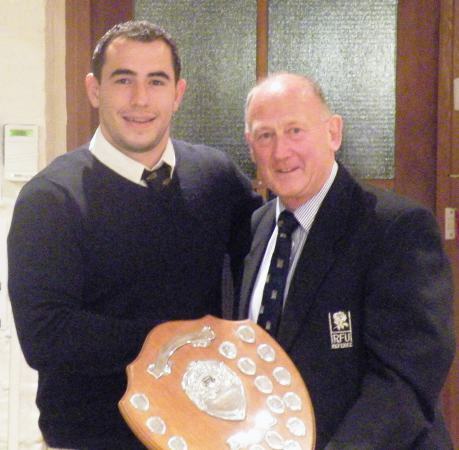 The “Tony Mead Memorial Shield” for the Cornwall U.20 Player of the Year went to Kyle Moyle. The fly-half was the lynch-pin of Cornwall’s fine run in last season’s U.20 County Championship. Having played last season for the Cornish All Blacks, Moyle moved during the summer to the St. Ives club where he is enjoying fine form with the “Hakes” having scored nine tries in their last two matches! He said. “It’s an honour to get this award and I’d like to thank all those who voted for me”. The highlight for the youngster in the black and gold jersey last season was the win over Devon at Hayle. “To beat Devon who travelled to down to Hayle with some good support was a big win for the boys and really capped a fine campaign, which just saw us missing out on progressing to the quarter-finals”.